Home » School Days » Fresh New Styling for Kids on the Go! Everyone loves Back to School and Kids Love Fresh New Styles from Janie and Jack! In many places children and their parents are already getting into the “Back to School” mode. Summer is still in full swing and many schools now start their school year during August. So just for you, Janie and Jack has a whole new line of clothes guaranteed to Make you Smile! The best part about that is, it will make the kids smile too! Kids may not say it out loud, but they do take an interest in what they are wearing. They may not be as fussy as mom might be, but that doesn’t mean they don’t care at all. 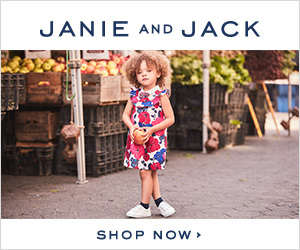 Janie and Jack has long been one of my favorite places to purchase clothes for my grandchildren. I love that they have so many new items that mix and match to perfection. You can go shopping with the kids and know that whatever pieces you purchase will be a winning combination when put together. Janie and Jack has sizing that will fit the slimmest of kids and the not so slim too! They carry a wide variety of sizes so that everyone can look and feel great! Decking the kids out for the new school year always makes you smile, but when they are decked out in Janie and Jack clothes, you know they look great, feel great and are comfortable too! Janie and Jack clothing has always had a great reputation for wearability and comfort. That hasn’t changed at all! It is still the best place for children’s clothes. Now it’s even better! Mixing and matching is at a whole new level. Everything at Janie and Jack is made especially for your children. Sizing for babies right through to pre-teens, Janie and Jack has listened to parents and delivered what they wanted for their children. I know that my grandchildren love it when their Nanny and Poppa come to visit and bring something special from the store that they love! Lauren loves her leggings, Addie just can’t get enough of the T-shirts and Blake, well he’s still little enough that when his PJ’s have a dragon on them, he’s all set! It makes me smile to see them wearing what they love. Janie and Jack has so many programs that will help to put a smile on every parent’s face. Join their mailing list and see what’s new at every season! We know that everything helps when it comes to clothing your family! Bookmark this page and get special “online only” savings and selections. It’s easy and quick and will help mom do some of the shopping after the kids are in bed for the night. If you have children or grandchildren, nieces or nephews, you need to shop at Janie and Jack! Fresh New Styling for Your Children, will make everyone smile when you see how great everyone looks! I love those shoes too! Cute! I love those camo sneakers! I bet every little boy (and some girls) would love to have a pair and would be their favorite shoes to wear.